With the expansion of e-commerce and online shopping sites, it is imperative to have stringent policies when it comes to shipping, return and other such transactions. The companies are legally bound to mention these policies beforehand. Naturally, since your customers are going to read these policies, you need to make sure they are to the point, straightforward and easy to understand. These are three of the most important traits that you will find in these templates here. You may also see HR Policy Templates. 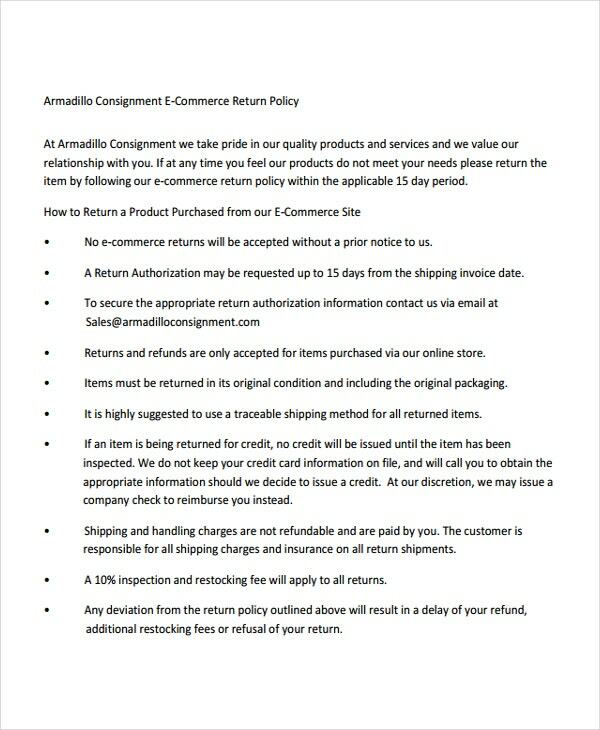 This return policy template comes in a Word format. So you wouldn’t have to go to the trouble of converting it before you edit it or add your personal touches to it. You may also see Policy Memo Template. 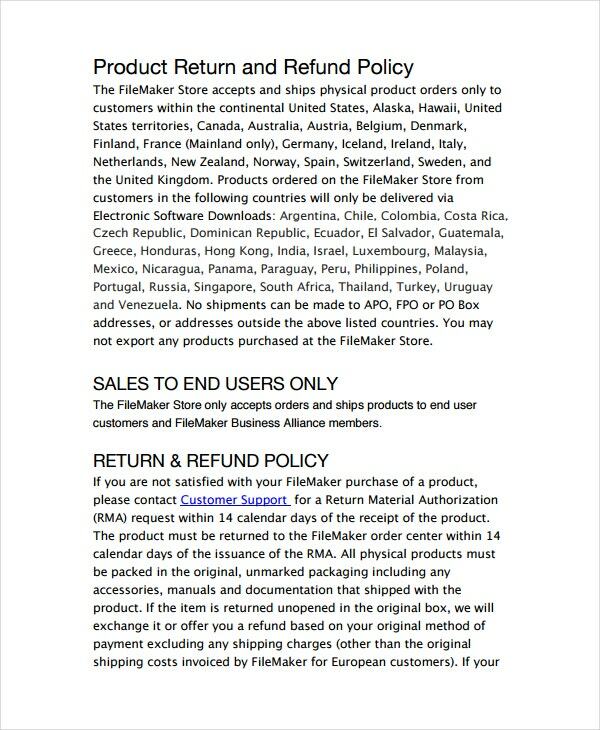 For a standard return policy, you can check out this template. You would be able to include your refund and exchange policies in this template which comes in a PDF format. This template, which comes in a Word format, gives you full authority to edit your policies. So if you feel the need to edit it later on, you wouldn’t have to face additional hassles. 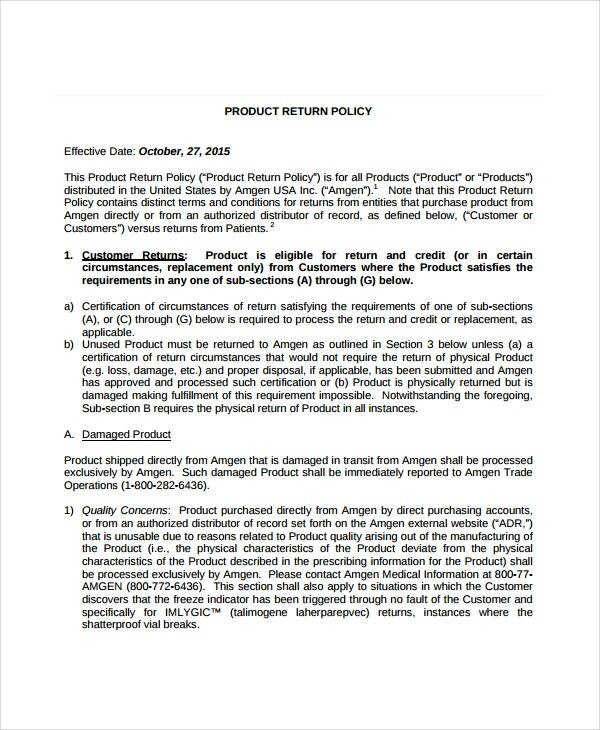 A return and refund policy is more detailed than a simple return policy. In order to create that, you can use this template which consists of distinct sections for both topics. This template comes in a standard PDF format. This way, you would be able to download the template and immediately start using it. You would be able to print it or even upload it onto your online store site. > Why Go for Return Policy Templates? Any store, be it a brick and mortar store or an online one, comes with return policies. 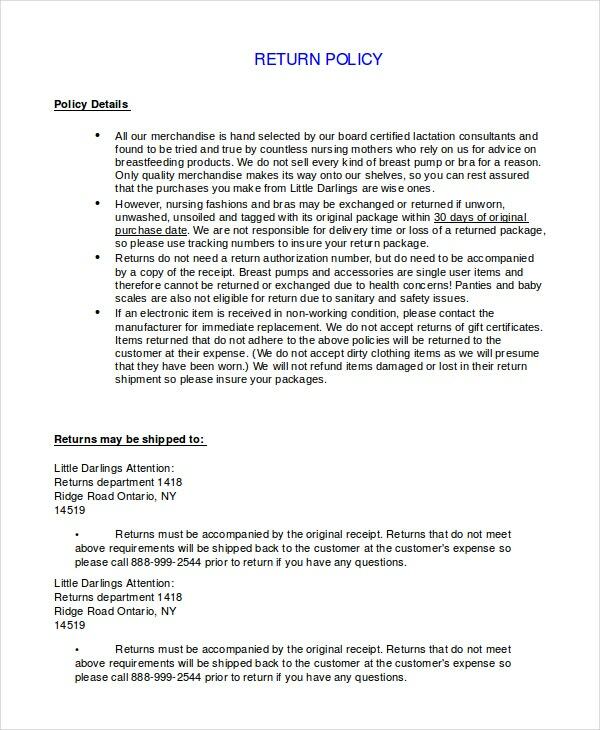 These return policies are meant for the benefit of the customers. 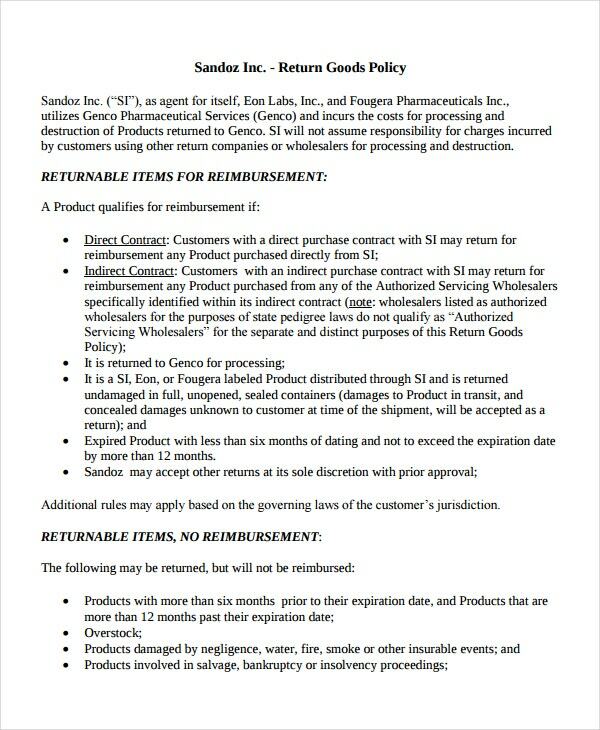 If there is any product that needs to be returned or is defective, then these policies will come into play. You may also see Quality Policy Templates. That is why it is necessary to have a return or shipping, refund policy or a quality policy that your customers can understand and grasp. These return & exchange policy templates would surely come in handy in case you are planning to update your existing policy or come up with a new one. 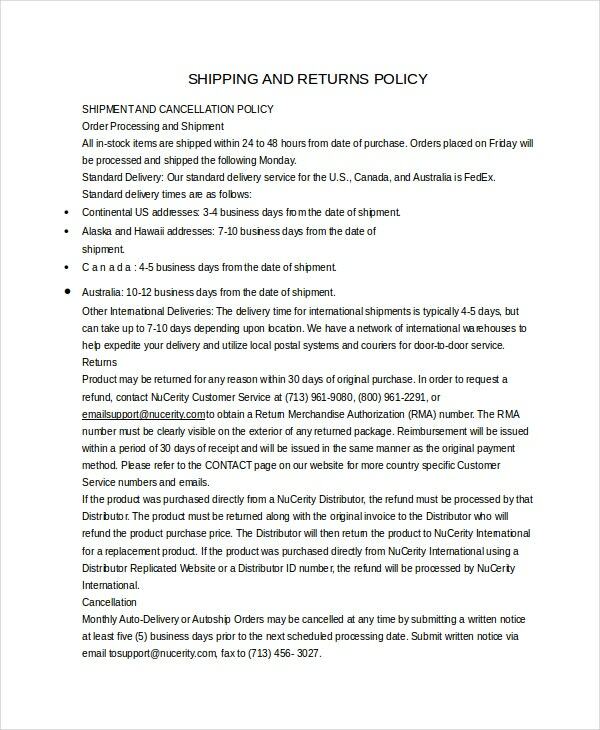 > What are the Benefits of Return Policy Templates? The return policy templates abide by the accepted patterns and norms followed across the globe. They are structured and well organized, thus preventing them from looking clumsy. They are completely customizable and 100% editable. They already contain certain standard terms and conditions, although you would be able to add your own. > How to Use the Return Policy templates? 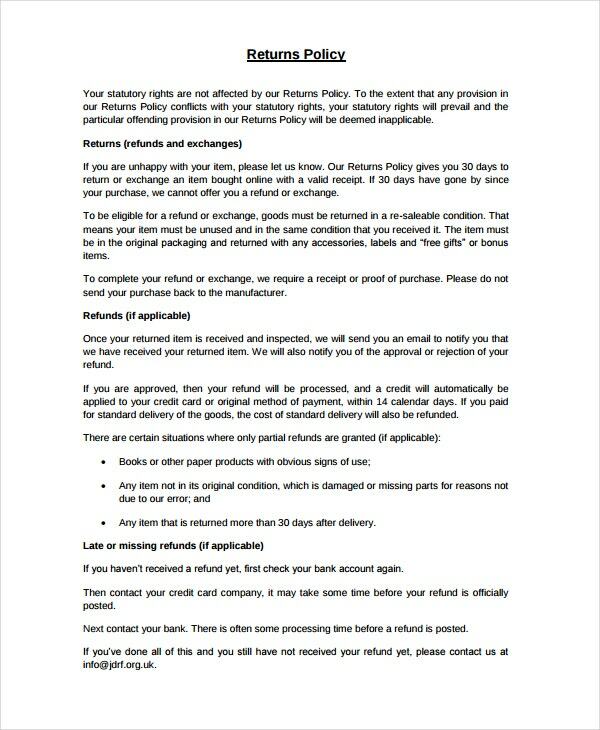 In case you run an online retail store, you would be required to put up your return policy on the site itself. 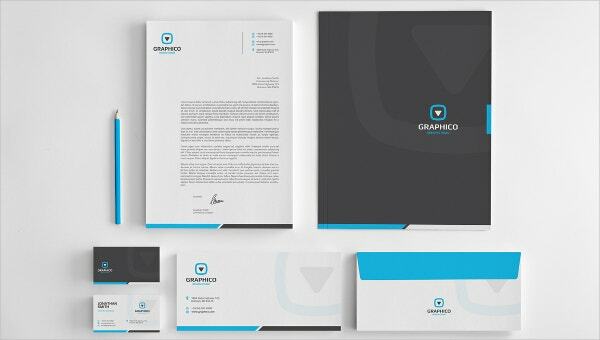 These templates have been developed keeping such requirements in mind. Once you decide upon a template, you can download them. You may also see Privacy Notice Template. If you are satisfied with the content of the policy, you can just stick to it. Or, you can always add some points and conditions of your own. Once that’s done, you can print the completed policy or even upload it onto your site. It is entirely up to you how you want to utilize your return policy template. You may also see Cover Memo Template. 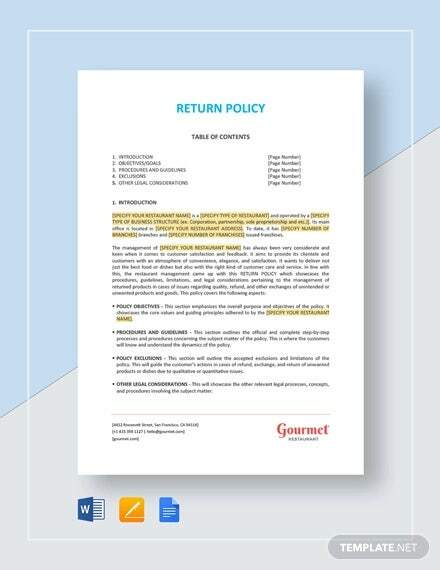 The return policy templates you see here are available in different formats like PDF or Word. You would be able to use and edit them with ease. Also, these templates usually come in a standard format. So if you are unsure of the pattern, you can just rely on these templates.